Sunset Grill and Tap: We Surrender! We at Nacho Patrol have had Sunset Grill & Tap on our radar for some time. Indeed, when the concept of Nacho Patrol was first conceived, we had these nachos in mind as one of our flagship reviews. We have all had them them in the past and remember them as delicious. When the phrase “Boston nachos” comes up, most people will find that their mind runs to these. So, now that we have a few reviews under our belt, and are feeling comfortable in our ratings system, we have decided to tackle the beast and wrestle it to the ground. We indulged in the Giant Fiesta Nachos, with barbecued pulled pork, for $12. Appearance: A behemoth of a nacho platter, piled high on a plate that is perhaps too small. tri-colored tortilla chips added a nice base of color. A veritable casing of melted cheese, sprinkled with scallions, with a few black olives peeking out from under, made us want to dig in immediately. Salsa on the side, sour cream and guacamole piled on top, over a small mat of shredded lettuce (9). Quality of Toppings: The homemade guacamole was the first indication that these nachos don’t mess around. However, the salsa was unfortunately canned and tad briny. The cheese, delicious and melty. Tortilla chips were obviously fried in-house; while this makes for a tasty, crisp platter, too many of these make us feel like a heart attack is imminent. The pork was utterly delicious…for what it was. There was still some conflict with the other prevailing flavors, leading us to the consensus that e should have learned our lesson last time at the BU pub– barbecue sauce is not meant to go along with nachos. From now on, we will make it our policy to refrain from ordering any kind of barbecued meat, no matter how tasty it sounds. Still, we commend that very few corners were cut on these nachos, something we heartily appreciate (9). Distribution of Toppings: Layers, layers everywhere! Up, down, all over town. We were in heaven…yet it quickly turned to hell. These nachos suffer from too much of a good thing– so many ingredients were piled on them that it was near impossible to get an even distribution. It took us a good ten minutes to crack through the cheese to get to the pork, and even then, only Guest Judge Doreen had easy access. A bigger plate would have been helpful, and perhaps a lighter hand with the meat. The sour cream and guacamole were woefully out of place on the top of the platter, encumbering our attacks and hampering an even condiment distribution. They would have been much better served on the side, which we will ask for in the future. The lettuce on top was completely superfluous. It added nothing in the way of taste, and little in aesthetics (7). Value: We ate till it hurt and still had a lot left over. For $12? These rock (10). Overall: 35/40. No matter what the complaints, we will put these at some of the best nachos in town. 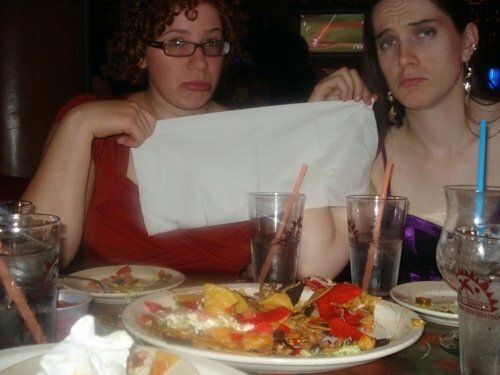 Sunset Grill, Nacho Patrol is waving the white flag of surrender. But we will return, and in greater numbers!